Homosassa is on the Gulf Coast about 75 miles north of Tampa. 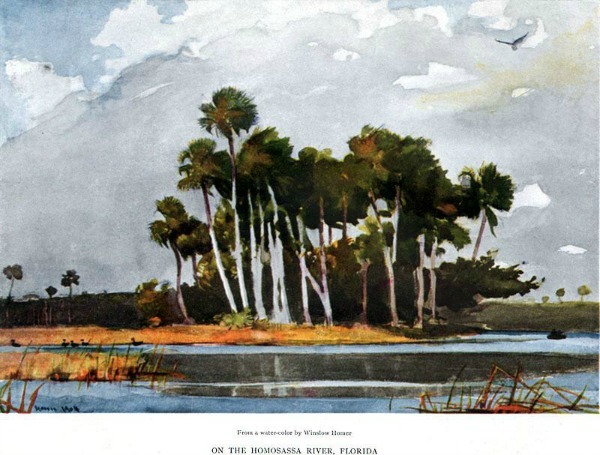 Winslow Homer was a famous American painter who spent a month in Homosassa back in 1904. During this Florida visit he produced 11 paintings, including the one below. 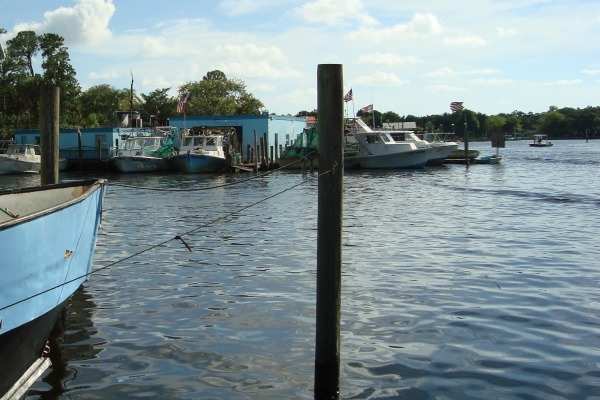 There are still sections along the Homosassa River that haven't changed since Homer's day. This old Florida village of about 2,500 souls rests among the swampy bayous near the mouth of the Homosassa River. The head water of the river is Homosassa Springs, one of Florida's First Magnitude springs located just west of US-19. The definition of First Magnitude means that the spring discharges at least 100 cubic feet of water per second, or about 64.6 million gallons per day. All of this fresh water at an average temperature of about 72 degrees is a magnet for manatees. The "sea cow" can't survive in water below about 60 degrees, and are smart enough to seek out the relatively warmer waters of the Homosassa River and other Florida spring fed streams. They concentrate in the winter months, but manatees can be seen year round in this area. A favorite place to see them is the Ellie Schiller Homosassa Springs Wildlife State Park. The visitor center is on US-19 and it's where you can learn all about manatees and take a river tour on a pontoon boat. The area along US-19 is known as Homosassa Springs and pretty much looks like any other stretch of Florida highway with strip shopping centers and your typical fast food joints. 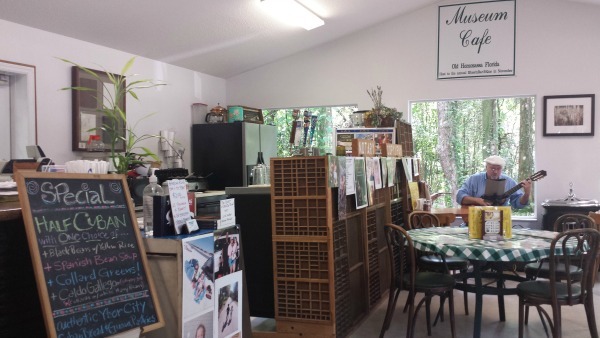 To get to the place where things are the way it used to be you need to drive to "Old Homosassa", about three miles west of US-19 on West Yulee Drive through some pristine woods. 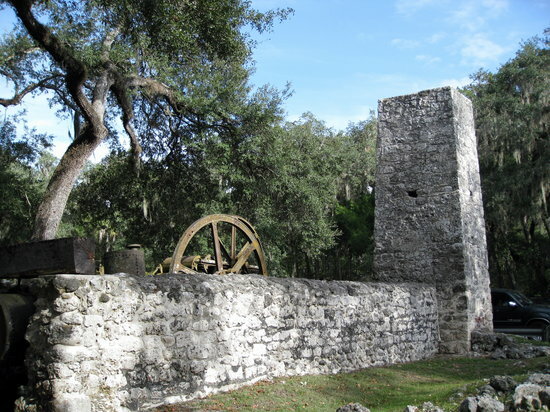 You will drive past the Yulee Sugar Mill Ruins Historic State Park and will want to take a look at what remains of a 5,100 acre sugar plantation owned by David Levy Yulee, who became a U.S. Senator after Florida achieved statehood in 1845. Yulee was a Confederate Senator during the Civil War and his plantation supplied a lot of sugar to the Confederate Army. Old Homosassa grew up along the south bank of the Homosassa River and in its early days relied on Yulee's plantation, lumber, citrus and commercial fishing. After the sugar mill closed and the cedar forests had been lumbered out, fishing became the most important industry. Commercial fishing is still important but has suffered from decreasing catches, net bans and various environmental regulations. Commercial fishing has been overtaken in modern times by recreational sport fishing. More tourists and state residents than ever enjoy the waters of the river and Gulf of Mexico and many businesses have grown up to serve their interests. Some local restaurants will even prepare and cook your own fish that you catch in the river or Gulf. Seafood is a staple in this town and several waterfront restaurants in the area cater to the visitor. 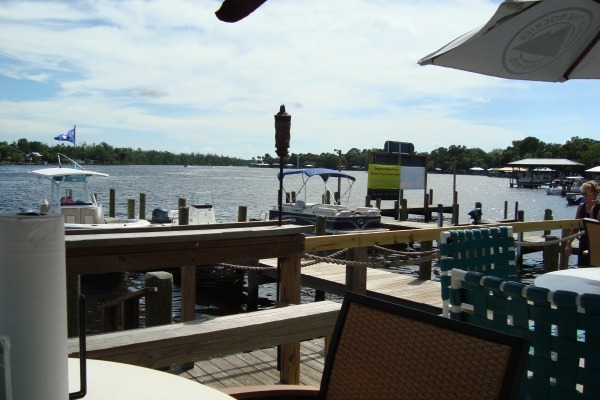 Weekends are especially busy in Old Homosassa. The town is crowded during scalloping season in July, August and September. Thousands of hungry visitors come to town to catch the little critters using snorkel gear and buckets. The streets and vacant lots in Old Homosassa are jammed with pickup trucks, SUVs and boat trailers during the season. Parking is hard to find, especially on summer weekends. 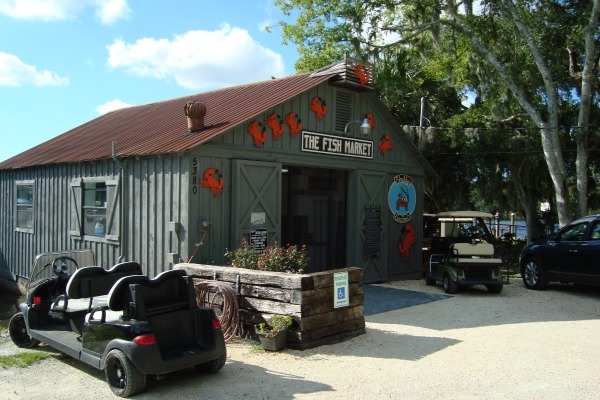 Like many old Florida towns, especially those at the end of the road, the laid back ambiance attracts the artistic soul and the relaxed good old boys who don't care much for golf or country club life and would rather go fishing. The average age of full time residents is 54, quite a bit older than the average in the State. 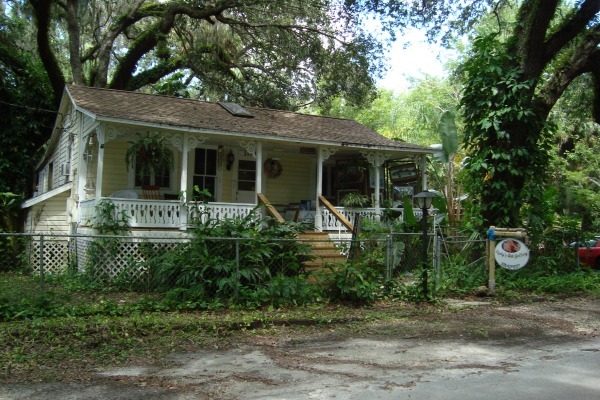 Lots of retired folks make do on very little here in Homosassa, and the variety of houses show it. You will see house trailers elevated on stilts or concrete blocks, weathered old houses that have been here for a hundred years, and newer modern houses on the various bayous, creeks, and canals on both sides of the river. Many Homosassa neighborhoods experience street flooding during the rainy season, and if a hurricane is headed into the area the town usually falls into the mandatory evacuation category. It would be dangerous to wait too long to escape a storm so it's wise to keep an eye on the weather report and leave when you are told to. Homosassa is a popular spot for Scalloping in Florida. 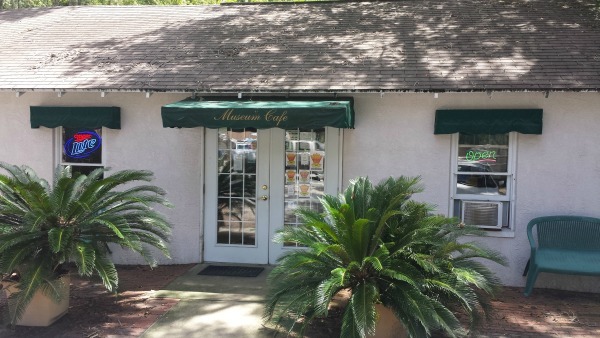 The Museum Cafe is located on the way into Old Homosassa near the entrance to the Yulee Sugar Mill Ruins Historic State Park. You will see the sign identifying a one story structure on the left side of the road as the Old Mill House Gallery and Printing Museum. This building in the quiet part of town houses not only the gallery and museum, but a great little restaurant too. When you enter the cafe, it doesn't look at all like a museum. The museum and galleries are in separate rooms off to the left of the dining area. The restaurant section of the building is bright and cheerful with lots of windows and specializes in lunch items. 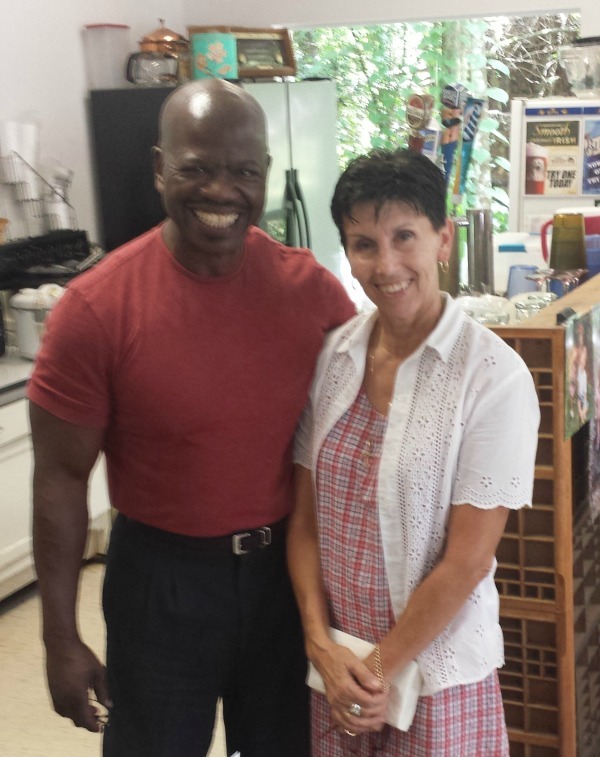 The restaurant and museum owner is Jim "Boe" Anderson and the restaurant manager is Carmen. The menu has a Spanish/Cuban theme with black beans and yellow rice, Spanish bean soup, deviled crab, guava pastries, cafe con leche and various wines and beers. Their most popular item is the Cuban Sandwich. They also have salads and one of the most popular is Boe's Bean Salad. That's a garden salad topped with black and garbanzo beans and rice. They also have collard greens on the menu along with Caldo Gallego, a Spanish white bean soup that originated in Galicia. I had the special: a small Cuban sandwich with a bowl of Spanish Bean Soup. As an extra, I had a stuffed potato. The potato is hollowed out, filled with ground pork and then deep fried. It was delicious. I followed up with a cup of coffee. Service was prompt and courteous and the background guitar music was just the perfect volume and tempo to make the lunch relaxing. James "Boe" Anderson is a fourth generation Floridian who is a man for all seasons. He started a career in the printing business in 1971 and when digital technology began taking over the printing trade, he decided to preserve the history of the letterpress trade by starting a museum. This restaurant is in a separate part of the building now known as the Olde Mill House Gallery and Printing Museum. 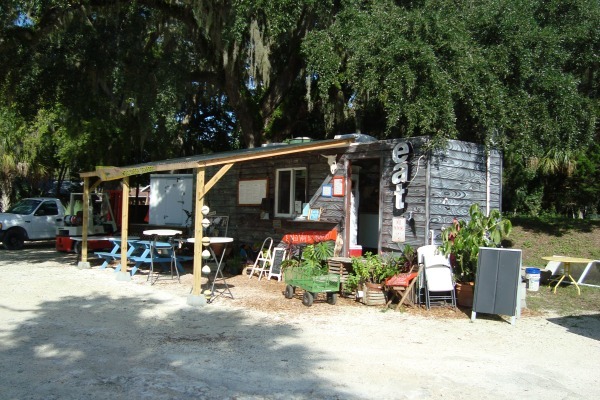 Jim also is active in the local art scene and established the Homosassa Frame and Art Gallery in the building. Jim showed me around the museum. It was an interesting tour with a lot of informative artifacts. Jim teaches students from graphic design schools in the museum and conducts various workshops on art techniques. He is also a musician who plays with the band Cool Corporate Cats. Among his music fans and friends he is known as "BoeCat", and has released 3 albums. He encourages and mentors other musicians and founded the Nature Coast Friends of Blues. The cafe is host to several music series. The day I had lunch the entertainer was classical guitarist P.D. Smith from Williston. Pete Smith is well known in Florida music circles and is a guitar instructor who also has a masters degree in music and a doctor's degree in humanities. He has recorded several albums and written books on jazz and blues. Museum Cafe is open Monday through Saturday from 1000 am to 300 pm.